Listeriosis is a disease we can get from consuming meat and dairy products, such as hot dogs and raw meat. Luckily, the bacteria can be killed by the heating system. This means you should never ever eat these foods unless you can reheat them. Good food handling and safe storage of food are important for all of us. Another aspect of prevention is advising high-risk groups such as pregnant women to avoid unpasteurized pts and foods such as soft cheeses like brie, camembert cheese, and bleu. Listeriosis during pregnancy can lead to early delivery, infection of, and worst case death of the baby. Pregnant women are especially vulnerable to this bacteria; 27 % of all cases in the U.S occur during pregnancy. Listeriosis can cause lots of problems for the baby including miscarriage with only mild symptoms for the mom. – Do not eat hot dogs or lunch meats. If you want to eat them, reheat them until they are steaming hot to rid the food of bacteria. 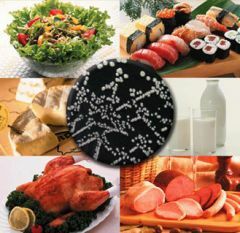 – Do not eat refrigerated meat spreads. – Avoid soft cheese such as brie, feta, or blue-veined. However, other cheeses are okay to consume. Check with your doctors for a full list. – Never consume unpasteurized milk or any foods made from it. Your doctors should make you aware of the above behaviors so that you can prevent Listeriosis. If he does not do this and you contract the disease, the doctor may be held responsible the damages that resulted.